There are times when I feel I have nothing and that I am a nobody. Just because I am a work-at-home-mom who earns a meager salary, completely dependent on my husband to live. It used to be the other way around. That time when I was still earning in my prime earning a lot– accepting projects left and right–oftentimes passing them on to others. And then my son came. Not that I am not happy with his arrival–he totally changed my life. I’m not complaining. I wanted this. 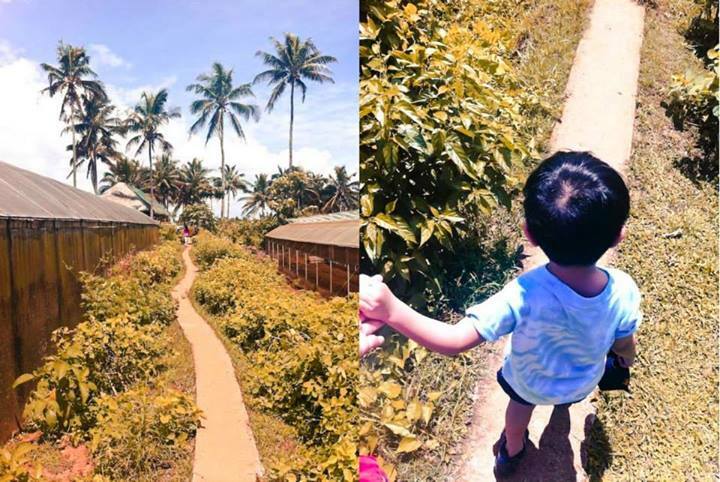 I dreamed about this– a housewife and a mother. I never saw myself as a career woman. Really. I had an epiphany more than a decade ago…that I didn’t want to stay in the corporate world. Good thing opportunity came so at 23, I retired. Actually, semi-retired. God has provided a way for me to leave my comfort zone–the corporate world. I saw my first work-at-home job as God’s way of preparing me to become a housewife. Within less than a year, I got married. God provided a way for me to learn how to keep a house as I had to take care of my brother, niece, and grandmother. My parents were then living with my sister after dad suffered a stroke. I had to learn how to manage a household. Finances and all. God provided for me and Joshua to get married at such a young age. We were 24. That’s young for today’s standard. Too young for two persons to be on their own. Wedding finances weren’t a problem that it only took us two months to prepare. Crazy? I know. But God made it happen. God provided me and my husband jobs so we could live on our own comfortably and not depend on our parents as we start a family. Again, allowed by grace. God provided and blessed my womb even before I took a pregnancy test. God provided us jobs (yet again) to provide for our son. To give him all that he needs and more– overflowing love, joy, and care. God provided us homes. The past six years of our marriage, we’ve changed residences a few times. But the last move, God brought us to our own house. It was all God’s grace and favor. Unexpected blessing. It happened quickly. On top of my mind is how God taught me humility and gave Josh and me the grace to wait in the Lord. Amazing love. Amazing provision. Amazing grace. Amazing God. “God has already provided”, my husband would always tell me. I sometimes fear about the future. It’s normal to worry at our age especially given the nature of our jobs (freelancer and contractual) but God has never failed to provide for our needs. Packing up our stuff and moving also made me realize that I am more than blessed and that I have no reason to be not contented. I know that there will be hard times and that we need to be ready. Just in case. Ready to be challenged. Ready to be in need. Ready to help. Ready to minister. This year, I know He will provide a way for us to experience freedom. We already are. I already feel free. I just need to remind myself. Last year, we saw God’s favor. His provision. His magnificence. His grace. This year, we want more of all those. We don’t desire abundance for selfish reasons but we want them for God’s Greater Glory. Thank You Father for choosing me to become part of Your family. I am glad that my parents came to know You even before I was born. Thank You for the legacy my dad left, the one heritage of having faith in You. I will forever be grateful for Your love and faithfulness in my life. I seek to have this kind of relationship–growing closer with You– all the days of my life. The holidays went by so quickly. It was more of rest for me because I had nothing to worry about during those days. Most of the time were spent just lounging at home, reading books, remembering the year, connecting with the people we love, and spending time with God. The year started with us celebrating with friends and family. We’ve been receiving guests every week as “housewarming”. I get tired every time but I realized it’s what I want to do: invite people over. I have learned a lot the past few weeks when it comes to hosting and I promise this year, I will try to be the perfect host. It will cost me money, time, and effort but I want to practice hospitality. But above all, I want this year to be about me and my God being closer than ever. And so I choose this word: ABIDE. I don’t remember how I came up with it but I know it’s what the Lord is telling me to do this year. 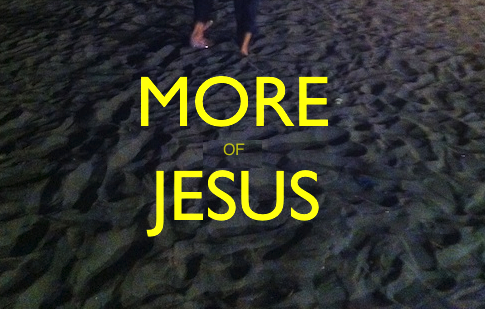 I already made a declaration that I want More of Jesus this 2014. My New Year’s Prayer includes me wanting the wisdom to pore over His Words. I tried to End the Year Right by listing down the things I’ve learned and what God has done in my life. I even wondered how it is to be Just Like Enoch. And then there’s our 40Days of Fasting at church. I joined this year and so far, so good. We’re on Day 10 now. The first week, we had our week of praying together at church. I had no excuse not to join because I am there everyday as I wait for my son. I got to lead the prayer time and devotion last Friday. Most Christian churches I know start the year with a fast. It’s only this year that I’m serious with it. I thought I couldn’t do it but I’m now able to give up eating dinner. I failed over the weekend (ha!) but weeknights are more bearable. I know it’s what the Lord requires of me this year. To be able to become a better wife and mother, I need to abide in Christ first. 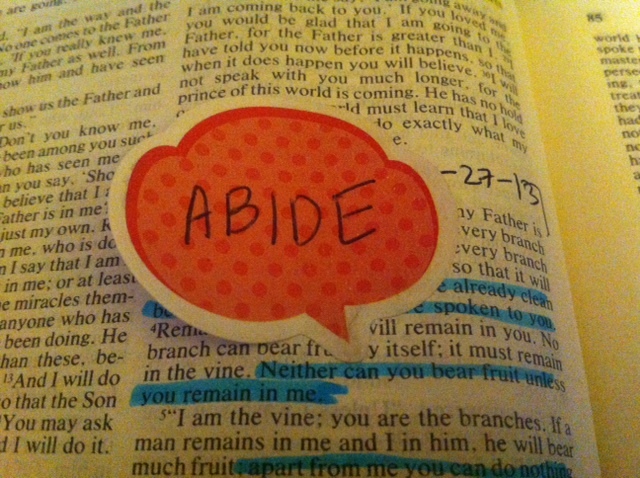 To abide in Christ. What does it mean? To remain in Him in all aspects of my life. To depend on Him for strength and grace to overcome. This 2014, I want to read the Bible more and obey what He has to say. To submit and soak in His presence. To be an effective minister, one must spend time with God first and foremost. I know I cannot give what I do not have so I intend to get to know my Savior more. I can only do that if I ABIDE in His Word. My word for the year is ABIDE. What’s yours? Faith becomes even stronger once expressed. The more you share, the more you grow. Since I want to know Jesus more, I think it would be best if I share more of His goodness in my life. I know there are a lot of books, blogs, and other resources about what Jesus had done but nothing beats His story written in my life and yours. Next to the Greatest Story ever told— the Story of Salvation– is yours and mine. How you came to know Christ and how he Had changed your life is another great story you could tell. Tell the world how He is working and how His promises are being fulfilled. Grateful to the Father for adopting me into His family. Being a child of God has its many privileges. I can come to Him directly in my thoughts and through prayers. I am thankful that I learned about His Word at such a young age. The Father has called my father who in turn brought us to church. What a joy it is to become part of a church— His family! I pray that my heart be a good soil where His word can be planted. I desire to have a humble and pure heart so the truth can be cultivated by the Father, and be harvested in the future for the glory of His Kingdom. May God reveal more of His truth as I seek His face everyday. I want to be more like Christ-like this year. I have so many things I want to change in my life but I should first seek what God wants. I have dreams and hopes but more than them being fulfilled, I want them to be aligned to His will. I claim honor and glory, but those won’t happen if I don’t seek His kingdom first and foremost. I sometimes find it hard to believe that the Lord requires something from us. I thought His love is unconditional? Yes. But He wants us to become more like Jesus: just, mercicful, and humble. To walk humbly with God is what I want. I want to go to places He’ll lead me. I want to learn real humility. Lead me Lord. All that I have and all that I am, I owe them all to God. There is nothing that I posses or can do that does not come from Him. There are times though that pride takes over but God, in His goodness and grace, would remind me of who He is in my life. Grace sets me free from the dangers of disobedience. Doubt is there sometimes but I am thankful for the hope that is based on His word. Everythin I have, I offer to God. 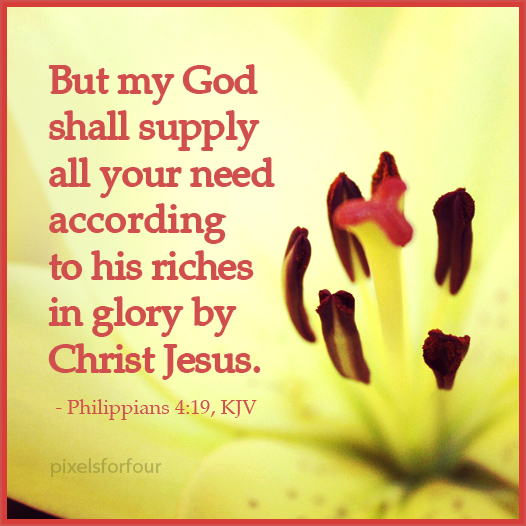 Everything I possess, I want to be used for His glory. Everything I do, I do for my One Audience. Don’t mistake happiness for joy. Not everything that makes you happy gives that kind of joy that is important. Don’t let relationships and your faith in the Lord falter whenever trouble comes. Even if death comes, you can still find peace and joy from having a close relationship with God. I want to know Jesus more. May this year be the year that my Lord and I are closer than ever. I desire to walk closely with Him as I learn to abide in His Word each day. Is that possible? Absolutely. As long as I keep the fire burning in my heart…this desire…this longing to be in His presence all the time. Only by His grace. God’s Word is true. It is my prayer this year that I would get to know my Lord like never before. I desire to be more fit physically this year but I hope to me more spiritually healthy. I want to have that insatiable hunger for the Living Word and a thirst for righteousness. I want that “never a day goes by that I don’t read the Bible” kind of life. I want more of Jesus. This 2014, may I learn to abide in You. I wonder how it is to walk with God everyday just like Enoch. He walked together with God each day so closely that Enoch was taken away to heaven. God must have been so delighted in him that He wanted him by His side in heaven. It may have been difficult for those left behind, Enoch’s family and friends, but his being in heaven was also comforting. I remember when my dad died, that moment of peace that I still remember and feel right now. That his death was gain. He had lived a full life and was not wasted. My daddy had shown me how to love, how to become a godly parent, how to be a friend, and how to be a servant. He had offered his life to God and walked closely with Him. Thinking about it now, my dad must have liked Enoch in the Bible so much that he nicknamed my brother with the same name. Perhaps he wanted my brother to also walk closely with God. I have never pondered on Enoch’s life until today. He was mentioned only a few times in the Bible and yet his life had a great impact—so faithful that God took him away. I want that kind of faithfulness Enoch had. I hope to have that joy he had each morning. I hope to have the kind of willingness my dad had, with nary a care, doing things for God because it wasn’t something he had to do but something he wanted to do. Just like Enoch, I want to walk with God. So closely that He’d want to take me with Him everywhere. By faith Enoch was taken up so that he should not see death, and he was not found, because God had taken him. Now before he was taken he was commended as having pleased God.